The main criticism from users is that Brushes 3 is not an upgrade to the original Brushes. Even the original had been replaced by Brushes 2, a version I must admit that completely passed me by. I now have Brushes 1.2.2 (red icon, very old) and Brushes 3.0.1 (blue icon, very new) to choose from. This is what happens when you look for automatic upgrades and never see one – why would you look on the App Sore and check if an app by the same name and developer has come up again? Being a completely new app, users are frustrated that they have to pay again for something they thought they could use forever with their initial payment. Having said that, Steve is not asking for several hundred pounds for his update like Adobe does with every major revision of every piece of software they produce. He’s asking for the equivalent of a cup of coffee, something most of us pay several times a week without even thinking about it. Besides, Brushes is free to try and still works without the addition of layers which is an in-app purchase. What users fail to realise is that if you sit down as a developer and write software for a year, then your development time isn’t being paid for with free upgrades. So you can’t make a living by releasing free upgrades. That is why I personally have no problem with an extra £1.99 the year after: if I want the new version I can pay, if I don’t need it then I’ll stick to the old one. Simple as that. This is not an issue when the old version can still be obtained – but in the case of a Brushes 3, Steve did something that reminds me of the New Coke incident in the early nineties: he removed the old version from the App Store, and now all you can do is buy the New Brushes. Users cannot install the old version anymore, unless they have the file as a backup on their computers. That is the fundamental flaw in what happened with Brushes 3: you’re forcing users to agree with you, that the new version is the best and only version there is, and they can no longer make a choice by themselves. Of course many will be angry about this. That is what Coca Cola did by replacing the flavour of their beverage in 1985. They didn’t introduce a new flavour alongside and let the customers decode which one they liked better. Coke made the decision for them, forcing their customers to like the new flavour as much as their management did. People had a massive problem with this. Users are also unhappy to lose some functionality of the old Brushes in the form of the Brushes Viewer for Mac: having started at a time when the iPad was only available at a fairly low resolution, Brushes would record each action users performed so they could later be played back and assembled off-iPad at high resolution. This was a revolutionary idea, one we haven’t seen from any other painting app to date. Not only could painters create very large files of their images, users could also showcase how a painting was created via video export. There are several masterpieces on YouTube and it’s a pleusure to see these come to live. To use this option users had to download a small utility for their Macs from Steve’s website. With the arrival of Brushes 3 however this utility has been removed. Moreover, the video and stroke export function does not yet exist in the latest offering. Many artists have come to rely on this essential function, giving them resolution independence while creating art and even potential income from print sales. Many users are – understandably – extremely unhappy about this. In a thread on Flickr Sprang apologised for his long absence, even though we’re still at a loss as to what happened during the years. He said he was surprised by the negative reaction to Brushes 3 and said that so much has changed in the iPad app world that a brand new version was necessary rather than an upgrade to existing code. As someone who dabbles in app development I can certainly feel his pain: new iOS releases mean that older ways of doing things just get abandoned by Apple, and newer easier ways come to take their place. Sprang also promised that hi resolution export will be implemented in the new version soon. Brushes 3 had been in the works for a while and he didn’t want to hold it back any longer. It appears to me that all Taptrix had to do was introduce the new version alongside the existing one and make it clear to users that there would be no support offered for the older version. Very important would have been NOT to remove either the old Brushes nor the hi res utility viewer from his website. That said, why not just bring it back and make a LOT of people happy? Users will understand that the focus has shifted to the new version. Devices and software change all the time, and I’m sure many woud willingly give the new version a try, probably even embrace it. But giving people a new toy while throwing away the old one is a bad move. This is fairly easy to rectify though. Yet herein lies the artists’ dilemma: do you create for yourself, or do you create for other people? Only Steve can decide what’s most important to him: Write software that he supports 100% without legacy and compromises; or be liked by the audience and be a commercial success while making other users happy. In a truly artistic sense I can understand option 1. If we look at Brushes itself as a work of art. Forget the old Brushes and focus on the new version. That’s what Apple would do. Da Vinci didn’t paint Monarch Lisa 2 due to its commercial success, he moved on and did something else. I just bought the new ipod touch 5 I guess it is called, with retina display and also downloaded the new brushes 3. What a disaster. Good thing I didn’t trade in my old ipod because I see that even though I still have brushes 1, brushes 1 works differently on the latest ipod in that brushes 1 will only email small file sizes. I used to be able to create 84mb size tiffs from the 1st brushes on the old ipod touch, and the new brushes 3 gives me these tiny size kb images. This is worse than New Coke. It is more like new coke but instead of 8 ounces, only one ounce. Not to even mention the awful brush shapes and lack of tap features. The fix? Viewer for version 3. 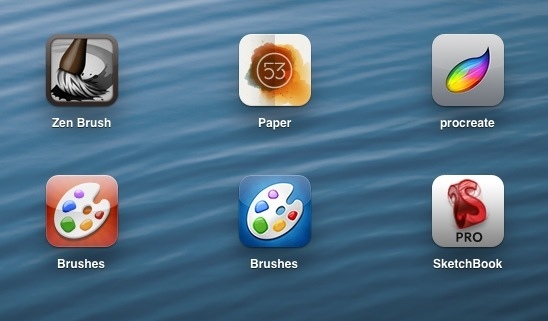 But Taptrix seems to have disappeared and Brushes 3 remains without high-res outout. THAT is the REAL problem. Bring back Viewer: and I will start using v3 again with all the iApp. Without it, Brushes is as useless for print work as basically everything else out there: too lo-res. He reduced his App that set the standard to a toy. BAD move. I feel the newer, blue, version of Brushes is a dumbed down version of the red one. I’d rather pay for something that has been working so well than get a freebie that is useless to me. I mainly use the red version to help plan or edit a painting…or do critiques of my student’s work. This is done by photographing the painting (or reference photo)and adjusting it with brushes….changing the composition, colors, values, etc. I don’t see how this is now possible with the new blue version. I can no longer recommend this to my students and I am hoping my current iPad keeps working so I don’t lose the red one. If I am missing something, I’d like to be corrected…or maybe another app can take it’s place if needed? I think “another app” is probably the way to go. It’s difficult to pick one that does it all, I keep coming back to SketchBook Pro and Procreate. There’s also 53 Paper and ArtRage. They all do different things, and it takes a while to get used to them. Looks like they are here to stay for the time being. Even though the new blue Brushes is open source now, there doesn’t appear to be much developer interest in furthering the app into something that could really take off. Or perhaps it’s the way the project is stewarded. I’m sad to say that the “Heyday of Brushes” is gone for good and it won’t be coming back anytime soon. I appreciate that it’s difficult for developers to keep software up to date: Apple release new developer tools and hardware every 6 months, which can make it impossible to update an existing project. I understand that – I’m an iOS developer myself. What I do not understand is Sprang’s stubbornness in pulling the old app and making the decision for everyone else. He thinks it’s best to pull the red version, so to hell with the rest of is. Period. That’s not just inconsiderate, that’s borderline mean-spirited. He must have understood at this point that for many of us, Brushes 1 was more than “a nice afternoon doodling” fad. I daresay that had he open sourced the code for Brushes 1 instead of Brushes 3, there may be many willing participants to simply keep the old version alive, rather than beat the dead horse Brushes 3. Thanks for the information about other options, tho’ perhaps less easy to use and satisfying. I guess the moral of the story is not to fall in love, as who know how long something will last. Flexibility and adaption!! Very disappointed…. Luckily I kep the original on my old iPad 1 so now have to be content with low res, but frankly, as an artist, low res is good enough for computer work… There is no res needed for the real thing on canvas or paper!